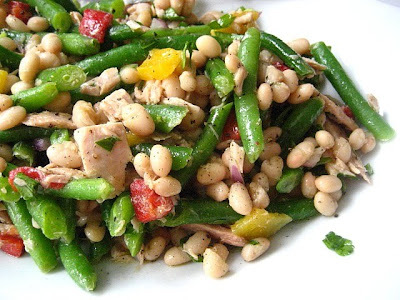 Once again, here is a great salad using those little white beans from a can, habichuelas blancas and some amazing quality tuna from a can. 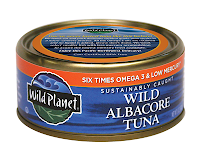 I recently had the opportunity to try Wild Planet Tuna. A sustainably caught wild tuna. It had a wonderful texture and flavor and is the highest in omega 3 good fats (3460 mg per can!) and the lowest in mercury content of all the canned tuna out there. I made a great easy salad with Wild Planet. You can add olives or tomatoes, but since tomatoes are not in season here, I used roasted red peppers instead. I like having this salad waiting in the fridge for me, it forces me to eat a healthy lunch. 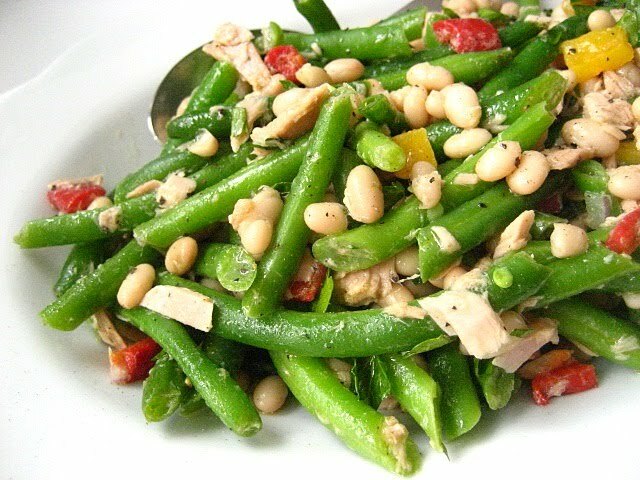 Cook the green beans in boiling water for 4 minutes until al dente. Drain and run under cold water to keep the nice bright green color and stop the cooking process. Add all the ingredients to a large bowl and sprinkle with sea salt and pepper. Toss with oil and vinegar and serve with fresh parsley on top. 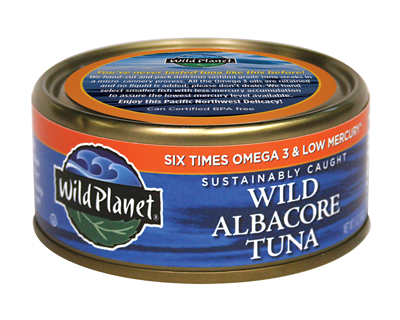 I just discovered Wild Planet tuna, too, at DeCicco's. I think it's delicious and best of all, my daughter didn't complain when I swapped it for her normal Bumble Bee or Starkist. This salad looks awesome and I even think I have everything for it in my pantry. Yay, lunch! What a lovely healthy salad Stacey. I really like the idea of using roasted red peppers instead of those winter red things they try to pass off as tomatoes. I'll keep an eye out for that brand of tuna. Looks delicious. And you're right, if it's in the fridge already made, it's perfect! Beautiful...and healthy! If it is in the fridge there wouldn't be an excuse skip lunch or eat something not nearly as healthy! White bean salads are for sure some of my most favorite things on this earth! Having one in the fridge makes me feel so good about the week ahead because I know I'll be eating right! This one sounds delicious especially with that superfood tuna! I will look for that tuna next time I'm at WF's. Haven't had this salad in a while and I probably have at least 10 cans of white beans in my pantry! I could definitely enjoy this for lunch today!